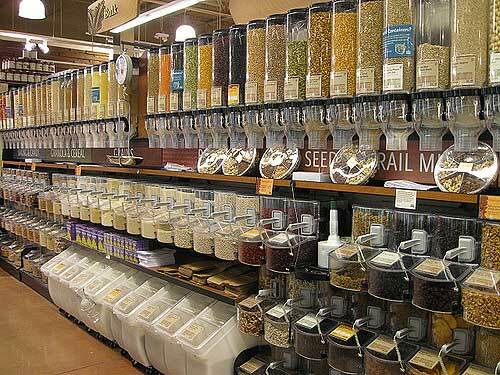 Purchasing bulk items from Whole Foods is a wonderful value for us, we get just the amount we want, I am confident in the freshness of the products offered, and can get expert help when making my decisions. Of course this comes after a period of exploration. The first time I noticed the row of bulk items I walked down the aisle and thought now what would I do with all of that stuff, how would I ever decide how to cook that, or that, the colors of the items on display are beautiful but what would it take to prepare them. I put my head down and kept on walking to the packaged items and the safety of the instructions printed on the package. Since we started our new and improved eating habits almost one year ago, I have been venturing down the bulk aisle, sampling things I knew about. Then one day I felt like I hit the jackpot. I found the Bulk Basics pamphlet, which is offered free at Whole Foods. This little booklet is a treasure trove of cooking information that I value along with my favorite cookbooks. Bulk Basics opened my eyes to kitchen adventures and taste treats Harley and I just love. This handy pamphlet offers a plethora of information on each subject beans, split peas and lentils, rice, grains, nuts, seeds, and flours. For example the data on beans include soak or no soak, how long to cook, what they look like and serving suggestions. Rice is a very complicated food, from deciding what type to choose, to the method of cooking, to proportions, to cooking times, 19 types of rice are indexed in this booklet. What about the often neglected grains that are available I didn’t know we liked amaranth or millet until I found the book. The section on flours offers detailed characteristics of 17 varieties of flour and weather they are gluten free, low gluten or high gluten content. I love the isle with the bulk containers of beans, rice, pasta, oats, granolas, fruits and nuts, my creative juices start to flow and I feel an awesome from scratch dinner coming on. The inspired learner in me holds this booklet close when I am deciding on what to have for dinner and I am feeling a bit adventurous. Laugh if you will, I say get the booklet and go shopping try something new and tell me what you learn. A variety of foods keep meals interesting for the cook as well as diners.